This may keep people out, but does it keep wasps or bees in? 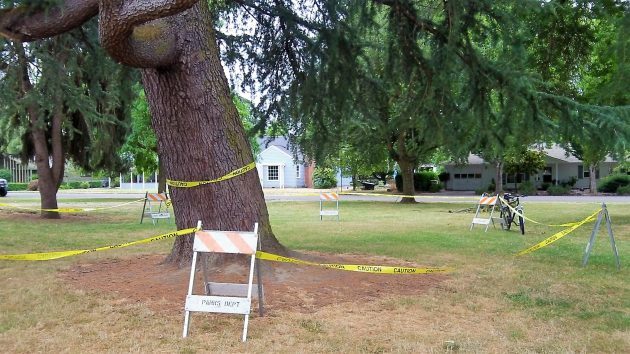 At first glance, seeing yellow caution tape in Albany’s Takena Park made you think that a venerable giant of a tree had been declared a hazard and was about to be cut down. Not so, however. It was a problem of a lesser sort. The contractor apparently had not yet got around to this particular call by Monday, because the tape was still there by mid-day. But nobody else was around to get stung, so it didn’t look all that urgent. 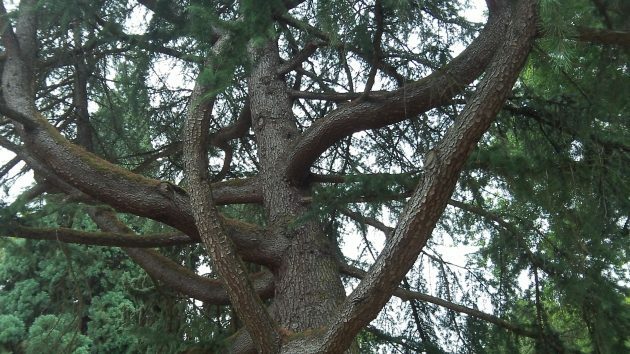 The good news: That towering tree, with its huge and bending limbs, is not in jeopardy. My only remaining question: What kind is it? If you know what kind of evergreen this is, use the comment feature below to let me know too. Looking at your picks, I am guessing Sitka Spruce which is not native to the Willamette Valley, but is common on the Oregon Coast.